You’re thinking about a golf trip to Arizona, good choice. As traveling golfers, we know firsthand that once you decide where to play, you have to decide where to stay. So we’ve tried to take the mystery out of this step for you. The Valley of the Sun is what we locals call the Phoenix metro area. It includes Phoenix, Scottsdale, Mesa, Tempe, Glendale, Fountain Hills, Carefree, Cave Creek, Chandler and several others. The entire Valley is approximately 75 miles wide by 45 miles deep. Since we figure you probably don’t want to spend your vacation time driving all across town, we want to help narrow your focus and pick a spot providing convenient access to the courses you choose. So, here’s the inside scoop on Phoenix and Scottsdale choices. Phoenix, the mega-metropolis of the Valley, is our State’s big city. It is home to the Arizona Biltmore and JW Marriott Resort & Spa, both have 36 holes on property. The Biltmore is in the heart of Central Phoenix; the JW Marriott is in North Phoenix and much closer to tracts like Grayhawk, Troon , The Boulders and Legend Trail Golf Club. Both have lots of shopping and dining adjacent to the properties. If you are a Hilton resort fan, you’ll want to check out the Pointe Hilton at Squaw Peak or its sister property, the Pointe Hilton Tapatio Cliffs. The “Tap” has a more north Phoenix location and an 18-hole course on property. The Squaw Peak property is located in mid-town, but provides easy access to the freeway, making for short drive to lots of great golf options. The Legacy and Arizona Grand are located in the Southeast area of Phoenix and are close to Sky Harbor International Airport. Both resorts have golf on property and are very close to the Raven at South Mountain, Papago and Whirlwind golf courses. The Phoenix Suns and Arizona Diamondback arenas are located in the heart of Phoenix downtown. If taking in a game or two is part of the plan, then you may opt for the urban experience provided with a stay at the downtown Sheraton or Hyatt. The closest courses to this location are the Raven at South Mountain, Papago, Encanto and the Biltmore, all about 20 minutes away. No matter what anyone else says, Scottsdale is definitely the heart of golf in the Phoenix Metro area. All major hotel chains have a presence in Scottsdale so the options run the gamut from familiar limited service national flags to 5-star resorts. There are two properties in Scottsdale who have well-earned golf-centric reputations, XONA Resorts and Meridian CondoResorts. Both are located in North Scottsdale and are close to TPC Scottsdale, Grayhawk, Troon North and a host of the other golf courses. They are also right around the corner from restaurants and shopping. XONA offers 1, 2 and 4-bedroom suites on a full resort campus, while Meridian features oversize condominiums complete with a wide array of resort-style amenities. When you phone either company, you’ll talk with an experienced golf vacation planner who will help you with course selections, book your rounds and your rooms. Should a 5-star resort experience be your desire, the City is home to Fairmont Scottsdale, the Four Seasons, Westin Kierland Resort & Spa and the Phoenician. All either have golf on property or adjacent to it. Plus they are within a 30-minute drive to all the best tracks in town. Feeling like you want to hang where the young-guns lay their heads? Then we’d suggest the W or Hotel Valley Ho in downtown Scottsdale. Staying at either of these two hotels will put you in the heart of the trendy bar/restaurant district and a 15-minute drive away from Talking Stick, ASU Karsten and McCormick Ranch golf clubs. If the combination of gaming and a brand new hotel is what you want, then Talking Stick Resort is the place. This 400+ room resort offers all the usual amenities like spa and dining, then throws in casino gaming as well. Talking Stick North and South golf courses are on property, so if you want to park in one place and not venture beyond the resort borders, this is a good choice. Baseball fans will like this choice as well since the new home of the Diamondbacks and Rockies are just across the 101 freeway (about two miles away). For those out there who are gonna cash in some of those reward points on a no-frills place to sleep, shower and go, you won’t have a problem finding a spot in Scottsdale. Marriott, Hyatt, Holiday Inn, Best Western and Comfort Inn are just a few of the options that come to mind. They are located all across the City so you won’t have a problem finding one that is convenient to your desired home base. Nestled between Phoenix and Scottsdale is Paradise Valley, one of the most affluent burbs in the State. 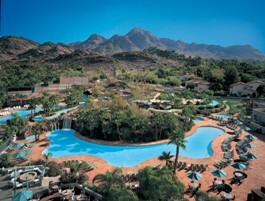 This town features two fabulous resorts – JW Marriott’s Camelback Inn and the Intercontinental Montelucia Resort. Both offer a complete resort experience. Camelback Inn features two resort golf courses on property. In our opinion, Padre should be your first choice, although Indian Bend won’t disappoint. Montelucia has has partnered with four golf properties providing their guests with priority tee times and the best pricing options available. We’ve just touched the top of the waves here, but it will provide you with a start. If you want to know more or we can help answer other questions, just click on the “Ask Us” tab below and we’ll get right back to you.